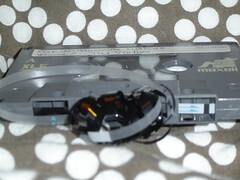 No one makes mixed tapes anymore. Everyone that I know has moved on to CD’s and iMixes. Most of my musical existence is entirely contained on my ipod. 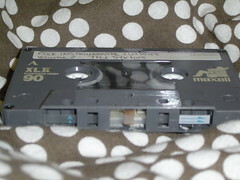 In fact, when I wanted to find an audio cassette I had to trek myself out to my 13 year old car to dig around for one (it is a bit of a time capsule – with a cassette player). All of the tapes had made their way into the trunk, usurped by my FM transmitter and ipod and languishing in the sun in the back. But i did find one. I started eviscerating it. And then i started knitting. The theme for this month’s whiplash challenge is “Alt Craft” and i decided to focus on the ‘nontraditional materials used with traditional techniques’ aspect. I already knew that though I could post instructions for my project, I want mine to be entered in the design category. 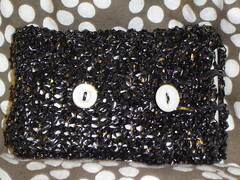 Knitting with audio tape isn’t one of the most pleasureable knitting experiences (tips at the end of the post). First, I wanted to liken it to knitting with Red heart Acrylic… But a more evil ribbon form of the yarn that twists up. then i started to get the hang of it. The crackling and crunching of the tape, and the squeaking of it against the knitting needles is actually pretty cool if you think about how its job it is to make sound. A few inches of garter stitch later, I was finished. 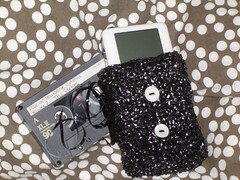 I constructed a cozy for my ipod from the innards of an old audio tape. My old and new music together at last. 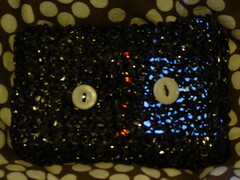 It knit up into a loose fabric and you can still see the ipod inside. the “fabric” is crackly and really really shiny. I can’t believe how shiny it is. I haven’t seen a metallic brown quite like it. I added two buttons so it would look like an audio tape, and a loop closure that wraps around the button to keep the ipod snug inside. Cast on with large needles – I cast on with 4’s and ended up knitting with 2’s the rest of the time. Knit loosely – Knit looser than you have ever knit. Take the time to pull each new loop through all the way without stretching the tape. Sizing up to larger needles won’t necessarily be effective because that would just increase the amount of tape in contact with the needles. you don’t really want that since the stuff is kinda sticky and crinkly. Try all of your needles – Plastic, wood, metal, give ’em all a go. You might be able to tolerate the feel of the tape against one more than the others. I settled on metal myself. Audio tape is not elastic – and it is not forgiving. if you stretch out the tape when you knit a stitch, you probably won’t be able to get your needle through it on the next row. i found it to be much easier going once I stopped stretching out the tape. 23 Responses to "Tape Case"
this is way cool! i love your idea! way to recycle! good luck in the whiplash this month! Most excellent! I had -only- cassettes in my car until just recently. So I have a few still floating around–The Police, Simon & Garfunkel, Guns N Roses and a mix tape. You are one patient, patient woman! What a great idea! This is such an AWESOME idea!! Really really great! i totally did that in chemistry class in 9th grade, i am not even kidding! 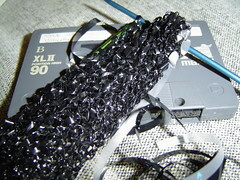 knit with cassette tape, anyway. too bad i knit too tightly; it fell apart and i gave it up. great minds think alike! i am re-inspired to try this! Looks awesome – if you use larger buttons I bet you could wrap your headphones around them to store em. That’s an amazing project – brilliant idea! That is AWESOME! It almost looks iridescent. Way cool, and impressive and imaginative! THat’s cool. Kinda like the old ushering in the new. Ok, I got to deep with that, but you know what I mean. That is too good! I want one! Very cool – thank you for sharing this! Such a great idea, to make something so functional! Not very pleasant stuff to work with, I agree, but it looks so pretty. I’ve been knitting flower brooches with tape, but switched to crochet because the tape isn’t stretchy at all and neither is crochet. i would love to try this..any suggestion on those fibers? I\\\’ve been knitting with tape recently too but then a friend questioned how healthy it was as apparently they contain heavy metals. Have you heard anything about this. Did an internet search but nothing came up. That is the best idea I\’ve seen all year! Is there anyone out there who wants used tapes for knitting? The charity I work for has about 900 to dispose of quickly because we have just progressed into CDs. how many stitches did you cast on for this?? great idea!